Holiday Candlelight Tour – Historic Fredericksburg Foundation, Inc.
Daytime Tours: 11:00 a.m. – 5:00 p.m.
Evening Tours (Sat. only): 6:00 p.m. – 8:00 p.m.
Preparations are underway for this exciting annual event! Stroll the picturesque streets of Fredericksburg and enjoy docent-led tours of historic houses. Professional decorators, designers, and artists beautifully decorate each home for the holidays—a delight for the eye and an inspiration for the upcoming holidays. Modeled after the hitching post in front of 408 Hanover Street. Ornaments are available in our Shop. Evening Tour: 6:00 p.m. to 8:00 p.m. Cocktail Party: 7:00 p.m. to 10:00 p.m.
Come ready to bid on our Silent Auction, full of amazing items, with all proceeds going to support the Historic Fredericksburg Foundation, Inc. The Cocktail Party location is still being determined. Purchase your daytime tour tickets in advance and save $5. Evening tour tickets also include a festive cocktail party. 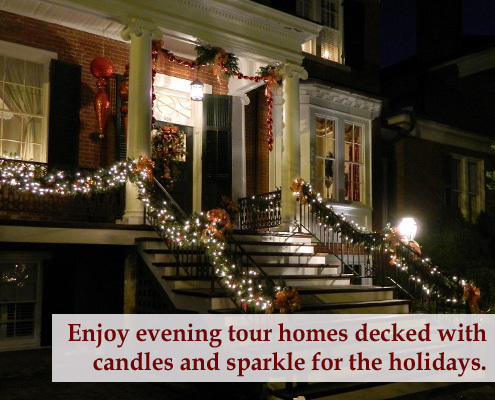 Evening tour ticket holders can see homes during both the daytime and evening hours. * HFFI Member tickets can only be purchased online or at the HFFI Office – satellite ticket locations prior to tour cannot offer member discount. Print your tickets and bring them with you to the event. Along with nearby street parking, please see the City Parking Map for additional parking lot options. Gift Shop hours are 10am to 5pm on Saturday, December 14 and 11am to 5pm on Sunday December 15. The Gift Shop location is still being determined for 2019. The proceeds of the Candlelight Tour fund the programs and projects of the Historic Fredericksburg Foundation, Inc., a non-profit membership organization that has worked to protect the historic and cultural resources of the Fredericksburg area since 1955. The mission of the Historic Fredericksburg Foundation, Inc., is to preserve, protect, and revitalize the distinctive historic environment and cultural resources of the Fredericksburg area. The Historic Fredericksburg Foundation, Inc., accomplishes this mission through education, advocacy and financial resources. What houses are on the tour this year? Locations for the 2019 tour are to be determined. There is no dress code for the tour, but we ask that you please do not wear high heal shoes as these may damage the floors within the homes. Otherwise feel free to dress comfortably and in accordance with the weather. Candlelight day tours are conducted on Saturday and Sunday, December 14 & 15 from 11AM to 5PM. If you purchase an evening tour ticket, you can also attend the evening tour on Saturday, December 14 from 6PM to 8PM. All tickets include a tour of each home, a keepsake tour booklet, and complimentary cookie with cider at the Gift Shop. What is the Saturday Evening Tour and Cocktail Party? The Evening Tour and Cocktail Party is a fun way to make a special evening event out of this annual holiday tour. A limited number of tickets are sold, so lines to see the homes are shorter, candlelight illuminates the walkway to the homes, and the cocktail party is a great way to celebrate the holidays with friends and support local preservation. The evening tour is conducted on Saturday evening from 6:00 to 8:00PM. The evening tour includes a tour of each of the properties as well as a Cocktail Party from 7 to 10pm. at a location that is to be determined for 2019. Tickets can only be purchased in advance of the tour (after October 1st) either by mail, online, or at the HFFI office in the Lewis Store, 1200 Caroline Street, Fredericksburg from 12 to 3pm on Wednesday, Thursday, or Friday. The evening tour tickets are $60.00 for one ticket or $100.00 for two tickets. The evening tickets are limited in number and must be purchased in advance. Is there additional entertainment on the days of the tour? Tickets can be purchased in advance of the tour starting on October 1 online or at the HFFI office in the Lewis Store, 1200 Caroline Street, Fredericksburg from 12 to 3PM on Wednesday, Thursday, or Friday. Tickets can also be purchased at the Fredericksburg Visitors Center, 706 Caroline Street, Fredericksburg during their normal operating hours. Only non-member, day tour tickets are available at the Visitors Center, HFFI member price tickets and evening tickets must be purchased directly from HFFI. On the days of the tour (December 14 & 15), tickets will be available at the Candlelight Tour Gift Shop. HFFI member tickets are $20.00. Non-HFFI member tickets purchased in advance of the tour day are $25.00 and $30.00 on the day of the tour. Tickets will NOT be sold at the individual houses. Do I have to choose either Saturday or Sunday? Not at all! Your tour ticket allows you to see each house one time—that can either be on Saturday or Sunday. See them all in one day or split them between the two and enjoy a whole weekend in downtown Fredericksburg! The tour will continue as scheduled even if it is raining or snowing. If there is precipitation outside, plastic covers will be provided to enclose your umbrella while within the home. Safety is our number one concern, so if conditions are too poor (such as slippery steps) then houses will be closed if needed. All sales are final, so please pay attention to the weather and plan accordingly as to when to attend. How long will I have to wait in line for each house? Depending on the number of attendees, the wait times for touring each home could be short or long. Visiting the homes during off-peak hours could shorten your wait time considerably. The busiest time for visiting the homes is on Saturday afternoon from 11am-3pm. Since these are private homes, all tours within the homes are guided and the number of persons entering a home at a time will be limited due to physical space within the home. Taking pictures and video recording are not allowed inside the tour homes for any reason. Photos/video of the exterior of the homes are okay, but never the inside. Basic tips about the tour. No food or drink is permitted within buildings. Beverages will have to be left outside and retrieved upon exiting the home. Any type of wheelchair or mobile assistance will have to be left outside and retrieved upon exiting the home. Children under age 15 must be accompanied by an adult. If there are runners on the floors inside the homes, please try to stay on them. We are trying to protect the floors for our generous homeowners. * Fredericksburg Main Street VA Inc.
Coldwell Banker, Carriage House Realty, Inc.